Without doubt, one of the most popular things to do in Carlsbad, New Mexico is visit Carlsbad Caverns National Park. Located just 20 miles southwest of Carlsbad, NM, it is a place full of beautiful sights and exciting activities for visitors of all ages. One of the top attractions offered at Carlsbad Caverns is the park’s Bat Flight Program, which allows visitors to experience the wonder of thousands of bats flying out of the cavern and into the night sky. If you plan your visit so that it falls between mid-April and late October, you should have the opportunity to take part in this memorable experience one evening. This wonderful free event begins each night around sunset with an informative talk by a park ranger at Carlsbad Caverns National Park’s Bat Flight Amphitheater. 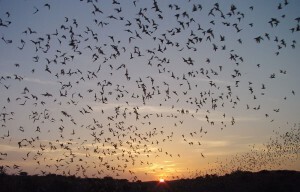 Around sunset, thousands of bats begin their daily exit from the caverns in search of insects to eat. This one-of-a-kind activity is a great way to spend an evening, especially if you have young children who are eager to learn more about Carlsbad, New Mexico’s fascinating wildlife. While bats are often associated with scary things like vampires and horror films, they are actually captivating animals that have no interest in harming people. The Bat Flight Program is a great way to learn more about the 17 different bat species that inhabit Carlsbad Caverns, including the large colony of Brazilian free-tailed bats that you will see take to the skies in search of food. That said, be sure to follow the park’s rules prohibiting the use of electronic devices, especially cameras, as flashes can disturb them as they fly. If possible, plan your visit to Carlsbad Caverns National Park for the late summer. Some of the most exciting bat flights take place in July and August, when baby bats born earlier in the summer first begin to join in the daily hunt for insects. 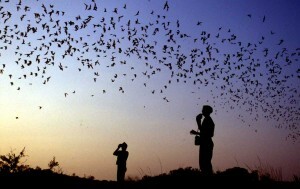 Early birds should also take advantage of the opportunity to see the bats’ return flights between 4 and 6 a.m., when they dive through the sky back into the caverns in spectacular form, reaching speeds up to 25 mph! Even if your visit to Carlsbad is planned for a time of year when taking part in the Bat Flight Program isn’t possible due to the yearly winter bat migration to Mexico, you can still learn plenty about the bats by visiting the park’s visitor center. Open year-round from 8 a.m. to 5 p.m. (and until 7 p.m. in the summer), the visitor center features an exhibit on bats that will tell you all about their insect-based diet that helps to keep the agricultural industry free from pests, as well as their importance in the pollination process which is essential to our ecosystem. Finally, if you decide to explore the exquisite natural scenery of Carlsbad Caverns, New Mexico first-hand by touring the caves, make sure to take a peek into the Bat Cave, a large passage near the cavern’s main entrance that is home to the majority of the park’s bat population. The 17 bat species that live in the caverns include big brown bats, silver-haired bats, and Townsend’s big-eared bat, which is known for its distinctively long, flexible ears. Plan your trip to Carlsbad, New Mexico today to see them all!